Have you heard of “disconnected youth?” It’s a term for young people age 16-19 who are neither employed nor in school. My county, Merced, has won the disconnected youth prize in California, with 13.7 percent of us bumming around aimlessly. That’s 50 percent higher than California as a whole and triple the rate in Bay Area counties like Santa Cruz. 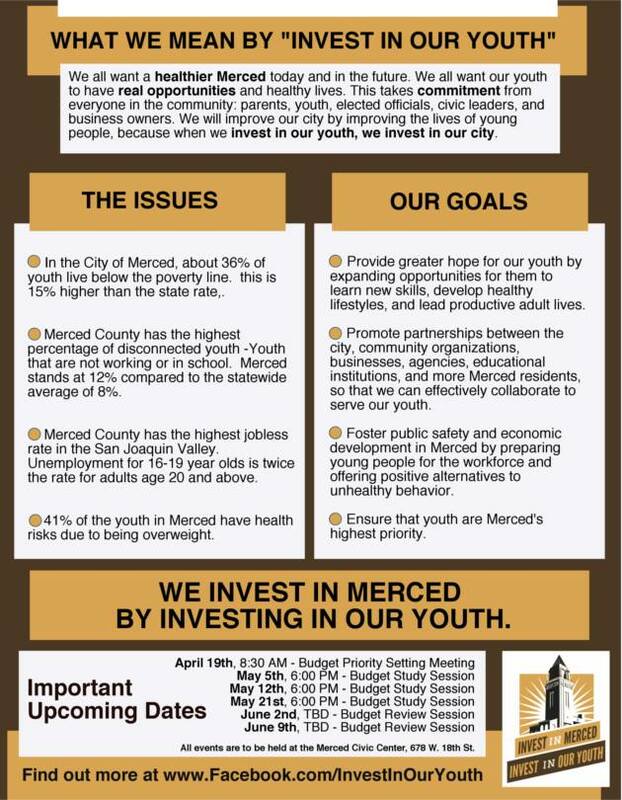 The youth disconnection is part of a bigger issue: Merced has the highest rate of child poverty in the state—40 percent according to the U.S. census—and we also have more kids, proportionally, than most counties. In 2011, the year I graduated from Golden Valley High School, Forbes called my hometown America’s third most miserable city. Since then, I have been part of a group of young people who’ve been organizing to get more youth services in Merced—recreation, jobs, summer programs—but we have been stonewalled by local officials. This frustrates me, because this is home. I am a 21-year-old Merced native, the youngest of five siblings, and have lived here my entire life. I have a job as an assistant at We ’Ced Youth Media, a local program founded three years ago by New America Media with community support. I’ve always wanted to raise a family here, and with the birth of my son six months ago, now I have the chance to. If you’re young and live in Merced, you can feel particularly disconnected on hot summer afternoons. Recreation and summer school options usually require money. All this leaves more time to do nothing but smoke pot or sit on the couch playing video games until night, when it’s time to try to find a house party. Get a summer job? The adult unemployment rate in Merced is nearly 17 percent right now, and unemployment among people age 16-19 is even higher. Basically, the only way to get a job around here is if you know someone who can plug you in somewhere. Before the recession, Merced spent a lot of money on youth recreation, but over the last few years, much of that spending ended. The two town swimming pools closed, which made it a lot harder to cool off in the Valley’s hot summers. Three years ago I was part of a group of residents and teenagers who organized to get McNamara Park pool reopened. We won, but spending on youth is still down 60 percent. Last year We ’Ced organized a forum to ask City Council candidates about youth issues. To prepare, we surveyed 500 young people in Merced to see what was important to them. They said their biggest needs were finding jobs and productive things to do. We joined with other youth groups to ask the City Council to help expand an underfunded summer jobs program the Merced County Office of Education already has in place to cover jobs for more than 100 teenagers, and help the Boys & Girls Club extend their hours and reopen some of the youth drop-in centers they closed down. The total for both of these requests is about $413,000 out of a total city budget of $194 million. Since then I have attended many council meetings, but I don’t feel that the members are listening to us. They aren’t going to allocate more funds to Parks and Rec for youth services and worse, will not acknowledge their responsibility as our elected officials to help develop the city’s young people. Oftentimes their body language shows their disinterest. They rarely respond to our testimonies or questions, and when they do their responses are usually rude, careless, or defensive. In years past, council members brushed off our requests by telling us that we had to be involved from the beginning of the budget process in order to see results. This year we’ve done just that. But from the beginning of the budget process, our requests for transparency and dialogue were met with either opposition or indifference. To his credit, new council member Michael Belluomini has asked the city manager to look into the budget to find money for youth services. But more than once—in public at council meetings—the city manager stubbornly pushed back at even the thought of going back into the budget. Even though the city has a significant budget surplus, the council has expanded the funding for youth recreation by only $35,000. The budget is scheduled to be finalized Monday night. It’s also been very disappointing to see and hear council members, city staff, and the mayor try to turn our requests into a fight between city employees and young people. The council and city staff tell us that in order to fund youth services they would have to let city employees go. They are very focused on employees; when they talk about public safety, they start talking about hiring police. To me, investing in young people is part of public safety. In a way, the City Council members are the ones who are “disconnected” from the city’s future. The overwhelming majority of Merced’s young people are non-white, while all but one member of the council are middle- to upper-middle-class white men. The struggle for recognition has changed those of us who got involved. In April we held a rally with 100 people. People are getting a sense of responsibility and leadership. Now we need to get some compromise from the city council. I wish I could say that I see my future firmly in Merced, but I don’t. I want to stay in Merced. It’s my home and it’s all I know. I don’t want to raise my son anywhere else. That said, if I hadn’t found my job at We ’Ced, I would not still be in Merced. I recently re-enrolled at the local junior college and have hopes of being successful in school and beginning a career to better the future of my family. But I also have a back-up plan: leaving Merced.